It's finally here! Harvest! My favorite time of the year! How I've missed working 16 hour days, seven days a week. Having my hands stained a constant purple. Wearing beat-up old work clothes every day. Oh, wait, I do that last one all the time, anyway. It's going to be busy, and it's going to be hectic, but I'll try my best to give you updates every week as to how things are progressing here at the winery. Photos, stories, anecdotes... anything to give you a little taste of what goes on here during crush. If you follow us on any of the various social media platforms, you probably already know that we've already been receiving fruit. On July 19th, we brought in the first fruit from our estate vineyard-- 1.6 tons of Sauvignon Blanc. We followed that up last week with another 1.5 tons of Sauvignon Blanc from our vineyard. Here's a shot of our press set-up, and the first bin of Sauvignon Blanc just waiting to be dumped in. Happy Harvest, One and All! The tree in front of the winery office has been getting regular visits from this fancy little woodpecker. The first wine I remember ever enjoying was a "Riesling." I was maybe 5 years old, and my parents were enjoying a bottle of Blue Nun out of the ceramic wine glasses my mother made when she was in college back in the early 1970s. My parents would often let me try a sip of wine if I asked, so sure were they that I would not like what I encountered. I don't remember what we were eating that night, but I do remember asking to taste the wine. And I liked it. I told my mom, "This is good," took a gulp, and she told me I wasn't allowed to have any more. I asked what it was-- resolved to remember for the future when I was an adult and could buy this for myself. That's how the Blue Nun brand came to be permanently lodged in my brain. When I was finally in college and out buying wine for myself, I remember searching the one general store in the tiny Ohio town where I first went to undergrad for a bottle of Blue Nun. It was nowhere to be found. The year was 2004, and another wine fad was peaking-- "Critter Labels." Unable to find Blue Nun, and with zero beverage savvy, I downed many a bottle of Little Penguin, Goats do Roam, and (of course) Yellow Tail. I spent many a year stuck in the popular wine category. I was content enough with the fruity, straightforward offerings. Then one day, a Riesling woke my from my stupor. I'll confess-- I'd just come from the dentist. I was celebrating not having any cavities, so I ducked into a nearby pastry and wine bar. The floors were tiny checkered black and white tiles, and the decor veered toward French cafe. I've never really been big on sweets, and my goal was definitely the wine. I remember asking the woman behind the counter to pour me the most aromatic white they had. She suggested a Riesling. From Mosel, Germany. I acquiesed. For the second time in my life, I was blown away by a Riesling-- this time a true one. It may have been the simplest Dr. Loosen on the market, but the aromas of green apple, lemon, and white flowers, each so distinct, leapt out of the glass. The flavors were crisp, distinct, and almost crystalline in their purity. This was a wine that wasn't hiding anything. Everything about it was upfront, cascading cleanly over the palate. It was impossible not to like it, especially in comparison to those heavy, murky, oaky Chardonnay beasts I'd been downing. My wine world changed in an instant. Two glasses later I caught the bus home, pondering this new experience. I am always surprised at the number of people who tell me that they don't like Riesling. I think part of this may have to do with the required evolution from Blue Nun to Dr. Loosen (or the personal equivalent for the storyteller). It's so easy with wine to have an experience with a sub-par version of a variety or region, and to then avoid it like the plague. I figure it's akin to the experience of eating a particular food, getting ill, and then never eating that food again. I'm here to reassure you, though. That crappy Riesling you had that one time... it might not have even been Riesling. You see, those bottles of Blue nun and Black Tower, even though they're packaged in bottles that scream Riesling, are often made of lesser varieties-- Silvaner, Muller-Thurgau, and Kerner. Grapes that don't sing the way that Riesling does. So if this is what has been holding you back, now you have a reason to give Riesling a second chance. I hope that you will. And if you do, and you like what you taste, let us know! We'd love to hear your story. One tank, covered in ice. Standing next to a number of others that weren't. This is part of our pre-bottling process, and it's known as cold stabilization. 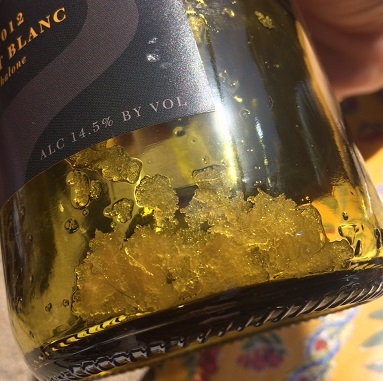 At low temperatures, the tartaric acid in the wine is less soluble than it is at warmer temperatures. When this happens, crystals of acid begin to form and drop out of solution. And the thing about this crystal formation is that ithis can encourage even more crystals to form. It's okay for this to happen in tank, when we can remove them through racking or filtration, but it can be a little concerning to see it in bottle. Once we decide on our final blend for a wine, we get all the components into a tank, and then set the tank temperature to below 30 degrees Farenheit. We want to blend first, because even minor changes in alcohol percantage, pH, or other chemical components in the wine can play a huge part in changing a wine's cold stability. Depending on the results of the cold stability testing we do prior to blending, we may add a small amount of cream of tartar, which encourages crystal formation. And then we wait. We'll hold a tank at this temperature for anywhere from 3-30 days. Some wines just require a little more time to stabilize than others. Once we've determined that the wine is stable, we'll filter, and call it a day. This doesn't mean that you'll never see a tartrate crystal in a bottle from us, but it does mean that under most standard wine storage conditions, your wine should remain clear. We probably can't help you if you tend to sip your wine through a 35 foot long frozen metal straw, but for the rest of you, we've got your back.